Day 5 of the Tour d’Enfer. Everyone else took a bus to cycle the north side of Galbier. I wanted to do something new, so my plan was to finally cycle up the Col du Granon. A couple of year’s back Le Cycle magazine published it’s list of the 30 most beautiful cycling climbs in France. 18 were in the Alps. Until today, I had only done 17. Col de Granon was the missing climb. Granon is high, steep, and spectacular. 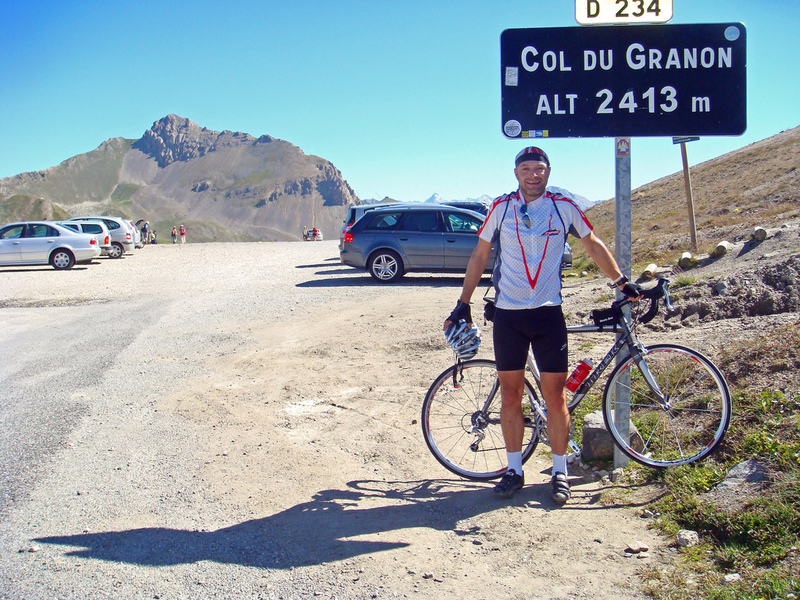 Perfect weather and I really enjoyed the climb – lots of cyclists – and quite a few mountain bikers really suffering. It appears possible to go over the top on mountain bike, but it’s pretty savage on the other side. It’s less famous than nearby neighbours Galibier and Izoard primarily because it is a cul-de-sac at the top. But that’s great news for cyclists as less crowded. After Granon I returned to Briancon and road through a quiet, scenic valley for 20 kilometres up to Col de l’Echelle and the Italian border (I’ll add a map when I get a chance). 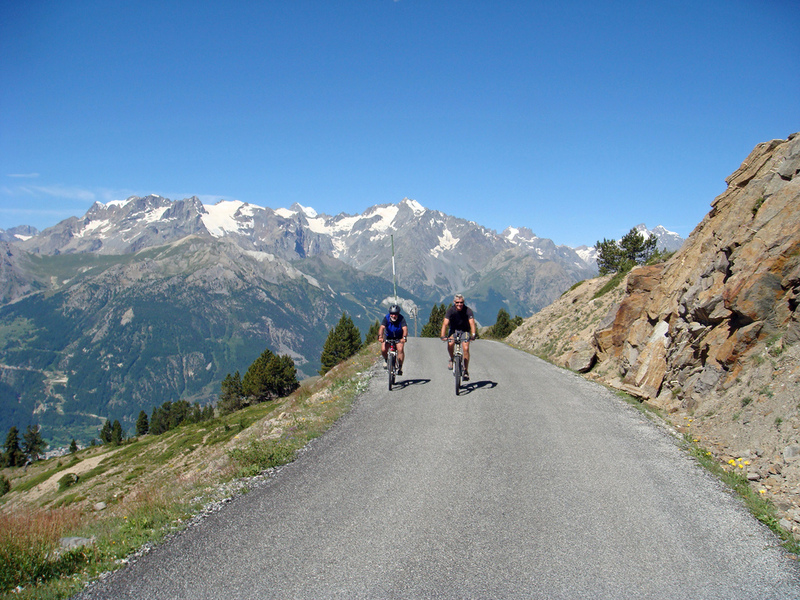 An excellent ride for anyone looking for something easier than all the mre famous choices from Briancon. It is a beautful area… but I feel that way about most of your routes and the pictures. Thanks again! most difficult climb i have done , steep , hot , high , wind , but great viewing on ecrins ! Just planning my itinerary for Briancon for a couple of days. 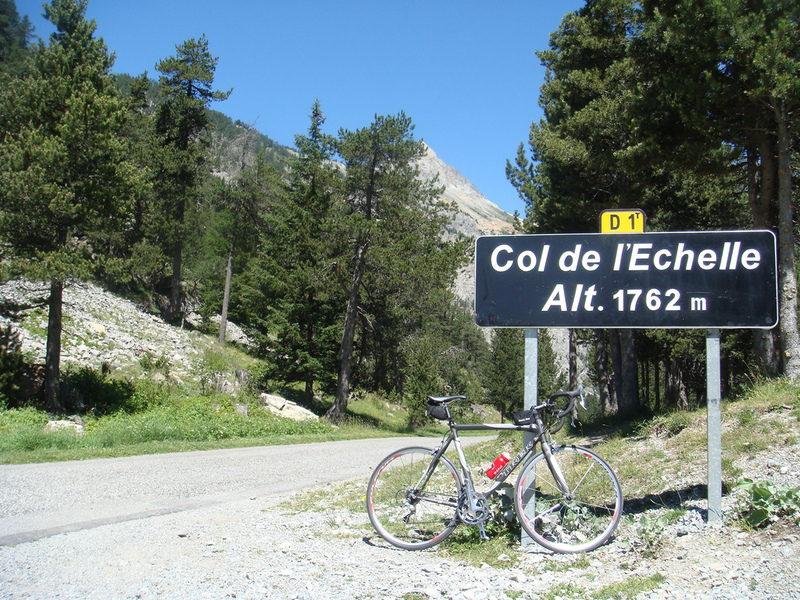 I don’t suppose you have details of the Col de l’Echelle by any chance? Thank you and hope you’re training hard for Ventoux!!! Do you mean the elevation profile? I think the above Echelle profile starts a little above Briancon …. If I remember it’s just 2 or 3 uphill but not crazy kms (except a short steep stretch to start) along the main road before the left turn into the valley where the profile starts. It’s not even remotely difficult from Briancon, but VERY nice – much quieter than the harder and more direct Col de Mont Genevre. It was a perfect ride for me after being exhausted after several big days and Granon that morning. The Italian side is somewhat harder but not crazy and apparently very nice – my friend Eric has done it but I have yet to visit. Yes that’s correct, the elevation profile. Thanks for that. Well at least I know from yourself that you’ve ridden it and it seems like a really nice ride to do. You have the same thoughts as me, Im sort of looking for a ride where I can really get the pedals spinning whilst not being that difficult (sort of like active recovery)!?!? We have Granon in our sights too!